EUGENE, OR – Eleven years ago, Linda Perrine left the tech world and a career with NASA to buy a neglected 32-acre farm. She turned the farm, which she named Honor Earth Farm, into an orchard where she produces organic Casina and Willamette hazelnuts. 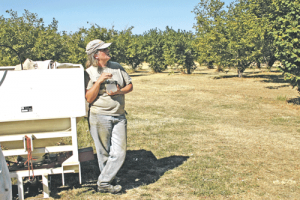 Perrine is one of only a handful of organic hazelnut growers in Oregon. Although 99 percent of U.S. hazelnuts are grown in Oregon, less than one percent are organic. The environment is important to Perrine; she harvests 90 percent of her nuts, but leaves 10 percent on the ground as her way to “give back to the wildlife.” She is proud of the environment she has created on her farm, and tries to be welcoming to the insects, birds of prey and coyotes. “I’m creating habitat for wildlife to live with me,” she said. Perrine admitted that it’s a challenge to be an organic hazelnut grower in Oregon during modern times. She joked she spends most of her time mowing the orchard to keep the ground harvestable. The ground cover keeps the nuts cleaner when she brings them in, and one of her other harvesting strategies is using a leaf blower to gather the nuts. To combat pests and diseases, she sets out traps and prunes her trees often. She believes she shouldn’t let the branches get to the point of growing lichen, and to stop the spread of eastern filbert blight she cuts and burns infected branches. To bring awareness to organic hazelnuts and the concerns of the smaller organic growers, Perrine helped start the Organic Hazelnut Growers Association in 2017. Since then, the association has moved to become a board-led cooperative, of which Perrine is now president. Processing has been the biggest challenge that organic hazelnut producers have encountered. Perrine said there are only a few organic nut processors in the area and it costs about three times more – about $3.60 a pound – than what conventional growers pay, because the nuts are not “uniform in size or cosmetically sound” so they take more time to sort and shell. One of the co-op’s goals is to build their own processing facility, and they are working on a fundraising campaign to raise $1.5 million to do so. For smaller farms around 30 acres, the added cost of organics makes it less financially sustainable to sell in-shell nuts wholesale for about $3.40 a pound. Instead, the preference is custom processing, which returns the kernels to the farmer which can then be sold directly to consumers for about $8 pound from a farmer to $20 a pound retail in bulk at stores like Market of Choice or Whole Foods. Due to the effort that goes into maintaining an organic farm, organic hazelnut prices are higher than conventional – which doesn’t appeal to everyone. That’s why it’s important for Perrine that the cooperative also makes strides in organic hazelnut education. On their website, OregonOrganicHazelnuts.com, they include a synopsis on the processing steps, but Perrine wants to go further. 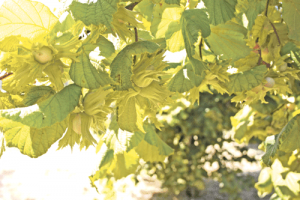 Along with adding more information to the website, the Organic Hazelnut Growers Association wants to host workshops to accompany their annual tours of Oregon hazelnut farms. 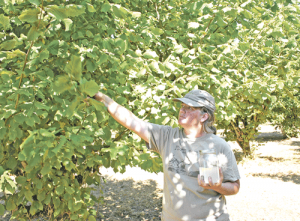 “We’re trying to shift thinking and raise awareness of Oregon-grown organic hazelnuts,” Perrine said.